Discussion in 'College Football Stars' started by Deceptive Speed, Jul 21, 2018.
rockybleier - thanks for all of your research - it's great seeing newer members contributing so much. I hope Bisharat actually gets a chance as well. He is up against the caste system though and he might of been sold a bunch of BS to commit to Colorado so they would not have to lose him to another Pac 12 team. BYU redshirt junior Beau Hoge has transitioned to running back. 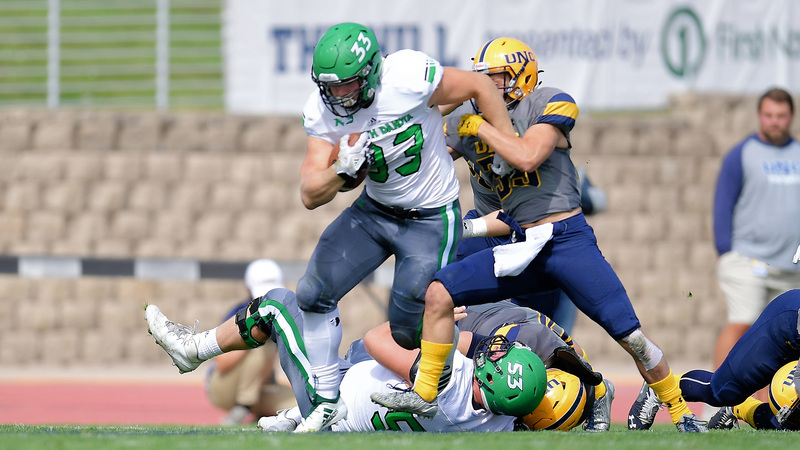 Hoge (6'1/220), the son of former NFL running back Merril Hoge, appeared in three games at the quarterback position last season. "It was kind of tough at first when [the coaches] approached me about it," Hoge said earlier this month. "But at the end of the day, it is all about whatever is best for the team." With Hoge's position change the race for the BYU starting quarterback job is down to three competitors: senior Tanner Mangum, sophomore Joe Critchlow and freshman Zach Wilson. Mangum started eight games last season for BYU, which opens its season September 1 at Arizona. While looking to find out where Quaide Weimerskirch from GA Tech transferred (he transferred to D2 University of West Florida) I found out their returning starter at RB is also white! His name is Chris Schwarz and he is a 5’10” 205lb JR, he had 999 all purpose yards last season, hope they can perform well and maybe get NFL looks in a couple years. Despite being D2 West Florida is a solid team, they made it to the championship game last season in only their second season of having a football team. 56. QB Trace McSorley PENN St. 98 att for 554 yds and 8 TD's! Eastern Washington RB Sam McPherson is another to add to the list. He is a senior at Eastern Washington University - the same school that produced Cooper Kupp. He is currently at 75 rushes 661 yds with 6 tds and 9 rec for 69 yards. keep an eye out on Ben Glines at Boston College. the redshirt sophomore averaged 5.6 yards per carry in his first career start at NC State (16 carries for 90 yards), including a nifty 21-yard scoring run in the third quarter. he’s also an excellent receiver (and split duties at both positions to start the year), and snared his 3rd touchdown catch of the season in the game, as well. BC’s strength coach says he’s a monster and is the toughest player on the roster. with the “real” tailback still battling an ankle injury, Glines may get the nod again this week against Louisville. Garrett Groshek 36-230. My favorite. Can he be the lead back in two years???? Zach Abey 21-42-8. So underused, sad. Alex Netherda (Cal) 1-8. Next year when Laird graduates? This should be all of the D1 backs with significant carries. Good to see former Big 10 back James Johannesson get 200 yards last week. Stats rockybleier! It's an uphill battle! And thanks to Deceptive Speed 's updated WR Stats too! "Looks like a Fullback but he's got wheels; no one catching him"
AJ Ouellette tearing it up tonight for the Ohio Bobcats.....Ohio is down by two scores early in the 4th, hurting AJO’s chance at getting more carries.....He’s had several nice, long runs. Here's a perfect scenario of the the caste system in effect. Judging by the stats of these 2 D1 RB's which one is the baetter NFL prospect: RB 1. 5'11 215 with nice blend of strength/speed to lead his team on 174 att for 958 yds and 8 TD's; RB 2. 5'10 200 is producing far less in the same amount of games in 144 att for 688 yds and 4 TD's. I'd pick the 5'11 215 RB Cade Carney a white guy who just shy Wakes000 yds in the ACC. However it was Wakes other RB B is Wakes 2nd Wakes other RB Matt Colburn is a black guy, and he's the who's the one with mid-round NFL interest not Carney. Havn't checked their 40 times or anything but Carney actually looks like the faster runner in game, so Carneys real problem is only skin deep. I'd pick 5'11 215 RB Cade Carney a white guy who just shy Wakes000 yds in the ACC. However it was Wakes other RB B is Wakes 2nd Wakes other RB Matt Colburn is a black guy, and he's the who's the one with mid-round NFL interest not Carney. Havn't checked their 40 times or anything but Carney actually looks like the faster runner in game, so Carneys real problem is only skin deep. Plus 3 of Colburns TD’s and 235 of his yards were in 1 game against Louisville which helped inflate his already average stats. Carney is clearly the better back. Havn't checked their 40 times or anything but Carney actually looks like the faster runner in game, so Carneys real problem is only skin deep. …..and here it is!!! This according to the Nike Combine Results! A white RB with Colburn's numbers coming out of high school would not get signed to a D-II school much less a D-I school! What am I saying. A white RB wouldn't sign anywhere. He would never even be thought about. Like he never existed. Nice highlight tape of Cal transfer and now ACU RB Billy McCrary, I believe he had 1000+ scrimmage yards and 10 TD’s in his first season at the FCS level. He’s got some serious speed and quick feet.